Nest Protect has been redesigned from the inside out. It has an industrial-grade smoke sensor, can be silenced from your phone, tests itself automatically and lasts for up to 10 years. It also tells you what's wrong and can even alert your phone. 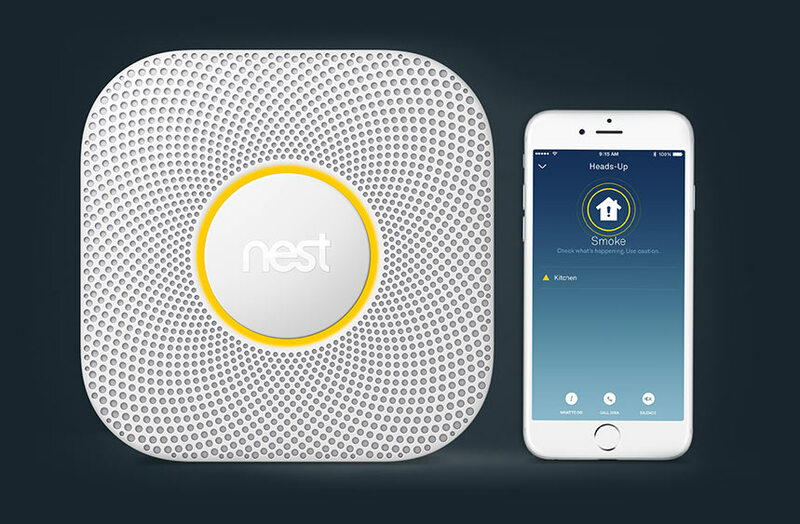 Nest Protect alerts your phone when something's wrong in case you're not home. Nest Protect is the first alarm you can silence from your phone. Barely burned the popcorn? Get a friendly Heads-Up that you can silence using the Nest app. It looks for both fast- and slow-burning fires. The Split-Spectrum Sensor uses two wave lengths of light to detect smoke. It tells you if there's smoke or carbon monoxide. When something's wrong Nest Protect speaks up to tell you what's wrong and where the danger is. Looks after you for up to 10 years. Its long‐life sensors keep you safe and sound for up to a decade. It lights your way at night. When you stumble out of bed for a glass of milk, Pathlight will light your way. You can adjust the brightness in the Nest app. It tests itself, so you don't have to. Nest Protect checks itself over 400 times a day and lets you know if something's up. It helps you sleep safe and sound. Tired of being jolted awake at 2 a.m. by a low-battery chirp? A green glow when you turn off the lights shows you that everything's OK. Sweet dreams. It reduces false alarms by looking for steam. Nest Protect uses its humidity sensor and an advanced algorithm to look for steam so you can take a nice, quiet shower. After setup, you can change the language that Nest Protect speaks to any of the above languages. EN-14604 – Smoke alarm devices. EN-50291 – Electrical apparatus for the detection of carbon monoxide in domestic premises. EN-50271:2010 – Electrical apparatus for the detection and measurement of combustible gases, toxic gases or oxygen. EN-50292 – Electrical apparatus for the detection of carbon monoxide in domestic premises. The alarm should not be installed in locations where the normal ambient temperature is below 4 °C or exceeds 38 °C. Humidity range: 20% RH to 80% RH (non-condensing).